From the minute it opened—on Christmas Day in 1865—it was Chicago’s must-see tourist attraction, drawing more than half a million visitors each year. Families, visiting dignitaries, even school groups all made trips to the South Side to tour the Union Stock Yard. There they got a firsthand look at the city’s industrial prowess as they witnessed cattle, hogs, and sheep disassembled with breathtaking efficiency. At their height, the kill floors employed 50,000 workers and processed six hundred animals an hour, an astonishing spectacle of industrialized death. 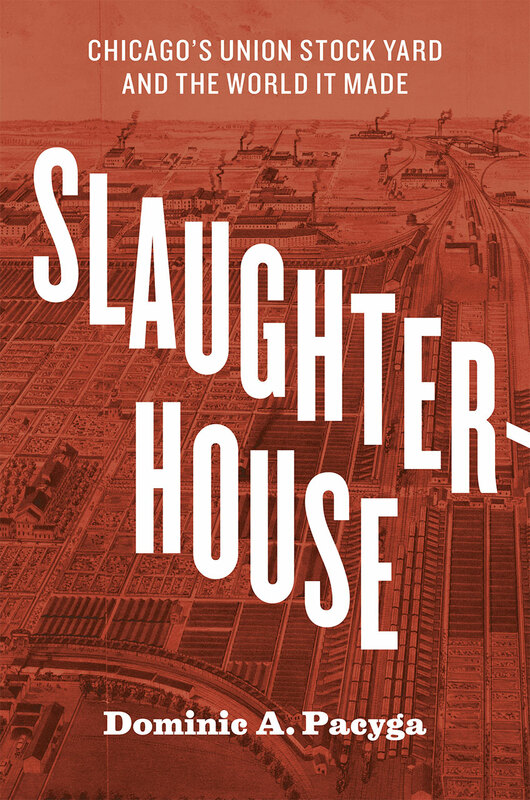 Slaughterhouse tells the story of the Union Stock Yard, chronicling the rise and fall of an industrial district that, for better or worse, served as the public face of Chicago for decades. Dominic A. Pacyga is a guide like no other—he grew up in the shadow of the stockyards, spent summers in their hog house and cattle yards, and maintains a long-standing connection with the working-class neighborhoods around them. Pacyga takes readers through the packinghouses as only an insider can, covering the rough and toxic life inside the plants and their lasting effects on the world outside. He shows how the yards shaped the surrounding neighborhoods and controlled the livelihoods of thousands of families. He looks at the Union Stock Yard’s political and economic power and its sometimes volatile role in the city’s race and labor relations. And he traces its decades of mechanized innovations, which introduced millions of consumers across the country to an industrialized food system. Once the pride and signature stench of a city, the neighborhood is now home to Chicago’s most successful green agriculture companies. Slaughterhouse is the engrossing story of the creation and transformation of one of the most important—and deadliest—square miles in American history. "For many people Henry Ford’s 1913 Detroit assembly line is a symbol of technological triumph. This book shows that Chicago’s 1865 disassembly line was an earlier more complete wonder, rapidly transporting animals, keeping them healthy and watered, dividing them into a wide variety of of products, communicating ownership and destination, and keeping meticulous accounts of all the processes. The speed and dexterity were put on display, proudly exploiting labor, advertising efficiency, making Chicago incredibly wealthy. This is a stunning account of the growth, complexity, rewards, and costs of modernity." "Pacyga is the great bard of Chicago-historian, raconteur, social critic. Slaughterhouse is a critically important book about one of the city's epic neighborhoods." "Pacyga has taken as his subject a single square mile, a small patch of urban land on the south side of Chicago, and has told an epic story—the rise of the Union Stockyards and Packingtown, their heyday as a great industrial complex and engine of modern America, their precipitous decline after World War II and their unexpected recent resurgence as a site of new industrial possibilities. It is a big story of rapid, and frequently unsettling, economic, technological, and social change, and Pacyga has told it in a vivid and compelling way." "Dominic Pacyga's book about Chicago's Union Stock Yard and the surrounding neighborhood is all at once a history of technology and a work of urban, business, and labor history. More impressively, he covers all these subdisciplines well in a slim 200 pages of text. The pictures, almost all of them from the author's own collection of Union Stock Yard ephemera, are astonishing and worth the cost of the book all by themselves. . . . The mastery of so many diverse subdisciplines on display here could teach any historian a thing or two about subjects thy think they already know." "Tracing the development of the 500-plus acre facility from the consolidation of several geographically scattered smaller stockyards before the Civil War, through the heyday of the Chicago industry, and into the era of decline in the 1950s, Pacyga ably synthesizes a vast amount of recent scholarship and draws upon his own original research to craft a compelling and highly readable narrative."